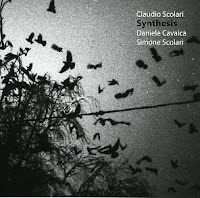 Hailing from Rome, percussionist Claudio Scolari is the leader of the multi-layered Scolari Project. He is joined by percussion-oriented multi-instrumentalist Daniele Cavalca and trumpeter (and son) Simone Scolari for Synthesis, and intriguing blend of electronics, synthesizers, and acoustic instruments including the vibraphone and melodica. From the opening notes of 'Synthesis' the trumpet cuts through with a taut and vigorous sound. The attractive lean melodic statements are given support by a lightly swinging percussion and a skeletal vibraphone, augmented by some choice electronics. The second song, 'Expression of Image' begins atmospherically but then quickly changes up the instrumentation, picking up a driving rhythm and the interesting and unusual combination of trumpet, melodica and a banjo-like synth patch. By the third tune, the group morphs into a piano trio. Over the course of 15 minutes, the configuration uses intensity and repetition to build the song. They take the sparse melody and swinging rhythm of the intro as far as they can, until they hit a point of entropy, trading short scales that disintegrate into each other. The last track I'll mention, 'Rituals', once again has a different aesthetic, this time featuring a tight interlocking lines between the vibes and trumpet, over an infectious bass and drum groove. So, is this a trumpet trio when the studio is a fourth member? Maybe it's easier to say that this is a trio of musicians going after an aesthetic that confidently combines improvisational and compositional sketches with folk, rock and modern jazz sensibilities.